As per report by a leading daily, Jiowill soon roll out cheap 100Mbps broadband Nothingled VoIP calling via FTTH service. Citing anonymous sources, the media report added that RJio plans to enter the wired internet segment by the end of this year, and the fibre-to-the-home (services) will also come with unlimited calling through a VoIP (Voice over Internet Protocol) phone as well as JioTV. The data usage in rural India has soared 190% due to the launch of Wi-Fi hotspots under the rural broadband project 'BharatNet'. Users consumed 95 terabyte in six months of the service. 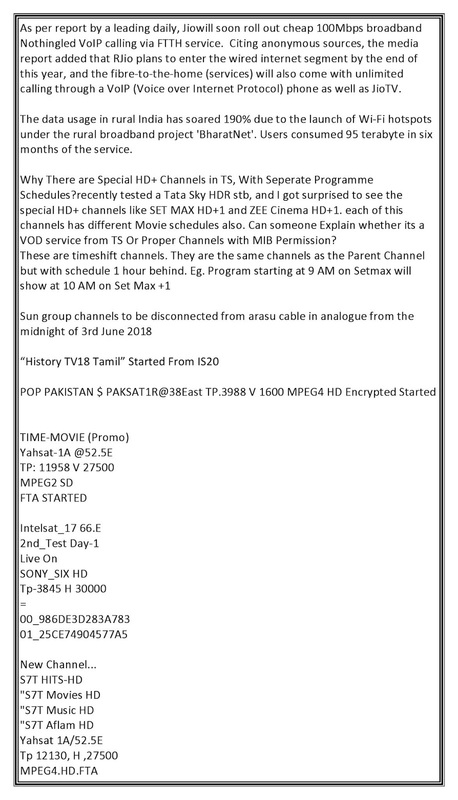 Why There are Special HD+ Channels in TS, With Seperate Programme Schedules?recently tested a Tata Sky HDR stb, and I got surprised to see the special HD+ channels like SET MAX HD+1 and ZEE Cinema HD+1. each of this channels has different Movie schedules also. Can someone Explain whether its a VOD service from TS Or Proper Channels with MIB Permission?